Mung ki sookhi daal is something that has a texture of hummus, smooth creamy on the palate and yet separate grains of this wonderful lentil make this daal really unique from regular daal recipes. 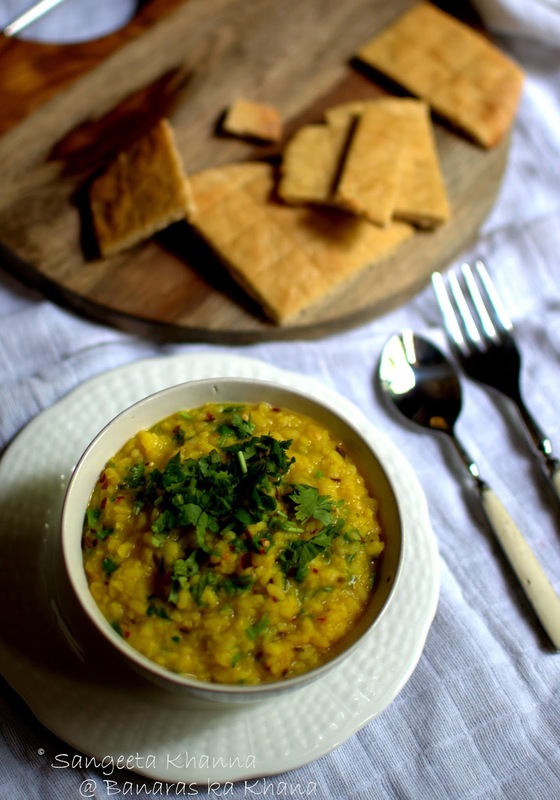 Yes, this is one of the few simple recipes of daal that taste so different from the regular fare. Daal is such a versatile dish in Indian cuisine and gets so many treatments depending on what state it belongs to. This sookhi mung ki daal is more of a north India thing, made in UP, Punjab, probably Bihar as well. 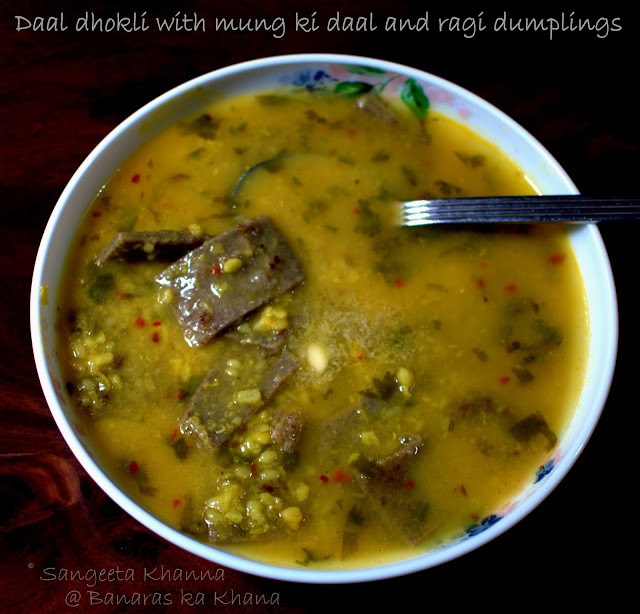 I have seen a variation of sookhi mung ki daal in Bengali families too, they make a mung daal sheddho (boiled mash) which is a nice mash of boiled mung daal, more like a hummus with mustard oil or ghee and some chopped green chilly, chopped onion and sometimes a hint of dhaniya patta. Our daals definitely get different flavors form different states, even different families of the same state or city. So this sookhi mung ki daal is a little difficult to achieve and many people just don't cook it because it ends up being a solid gooyi mess or the cooked lentils feel too dry. I cook this sookhi mung ki daal two ways depending on how dry I like it and if I am adding coriander greens or fresh baby spinach to it. If you want to mix some hopped greens in the daal it needs to have a little liquid so the chopped coriander greens are incorporated well into it. Pressure cook the mung daal with the said amount of water, salt and turmeric powder. Cook only till the whistle blows and then take the cooker off the heat. Let it cool on it's own. Heat ghee in a small pan and add the asafoetida, chopped garlic and cumin seeds, wait till everything gets browned a bit. Add the chilly flakes and pour it all into the cooked daal along with 1/2 cup water. Add half of the coriander greens (or spinach if using) and give it a good mix. Simmer for 3-5 minutes till everything is incorporated and daal is a thick consistency. Garnish with more coriander greens and serve hot. We love it with ragi or whole wheat rotis , pita crisps and even with rice. Being an absilute daal lover I can have it as a meal. The leftovers are diluted with water, and some rolled out ragi dough (cut into strips) is added to make it into a nice daal dhokli meal. My comfort food, I plan daal leftovers for this. And now is the absolutely dry version of sookhi mung ki daal. For this one I pressure cook the daal twice and the cooked lentil looks separate but you can't mix it further as it would result in a hummus like paste. Not that it would taste bad, but it wont be suitable for our dal roti meals. You are supposed to 'spoon' the daal using a piece of roti and enjoy this bite with utter bliss. Pressure cook the mung daal with salt, turmeric powder, tejpatta, asafoetida solution and the said amount of water. Cook only till the first whistle blows and take off heat, let it cool on it's own. Heat ghee in a small pan, add the cumin seeds and let them brown and get aromatic, taking care not to burn them. Take the pan off heat, add the chilly powder and let the chilly disperse in the ghee as it cooks. Pour this tadka as soon as the pressure cooker cools down. Mix well and cover the lid again and pressure cook again till the first whistle. You might need to add 1/4 cup of water before the second round of pressure cooking, if you don't see enough liquid to cook it again. Serve hot with a drizzle of ghee. 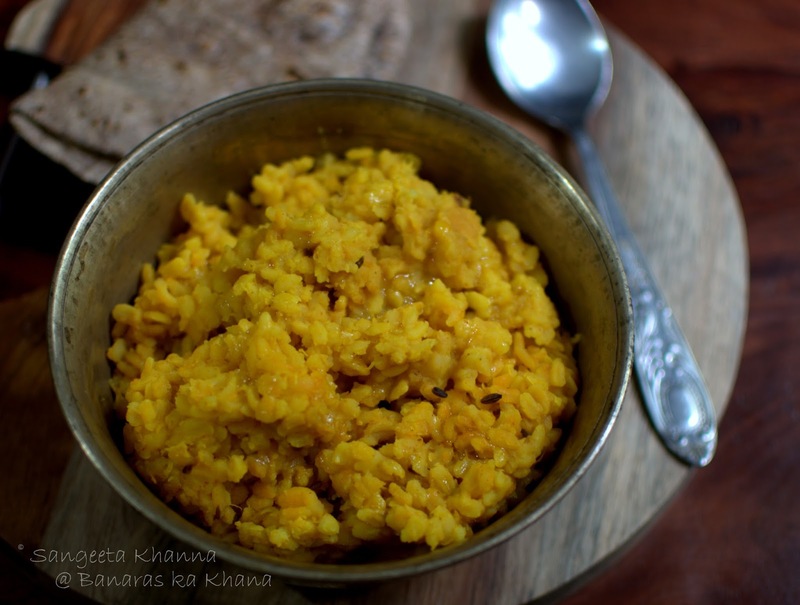 This is very aromatic mung ki daal and the ghee makes it even better. Have it with roti and some subzi and raita/salad on the side. And do let me know if you liked it. Awesome dal...delicious and tempting..love the clicks!!!! Lip-smacking goodness. This is true mung dal flavor I was looking for since my childhood. I could never replicate this on my own without your post. Your are true master teacher.